Perhaps you've noticed, I've been captivated recently by the beauty and history of the original Penn Station. This interest started when I was researching my post, "A Tale of Two Commuting Hubs." I've been commuting from Hicksville Station for a long time. 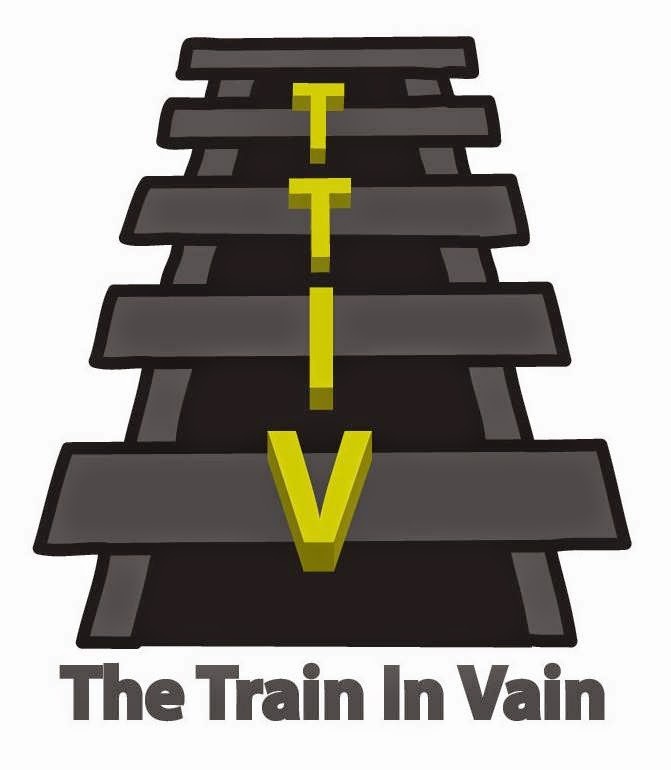 Usually, I have tunnel vision as I rush to the platform. But today, I saw something that I never really took notice of before. What was it? A 5,700 lb. stone eagle, proudly perched on a pedestal. What's so significant about that? 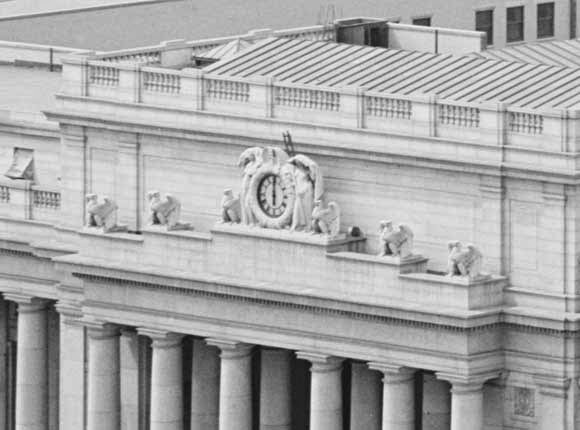 The original Penn Station was adorned with 22 stone eagles. You can see six of them in the black and white photo, on either side of the clock. When the building was demolished, the eagles were destined for the landfill. 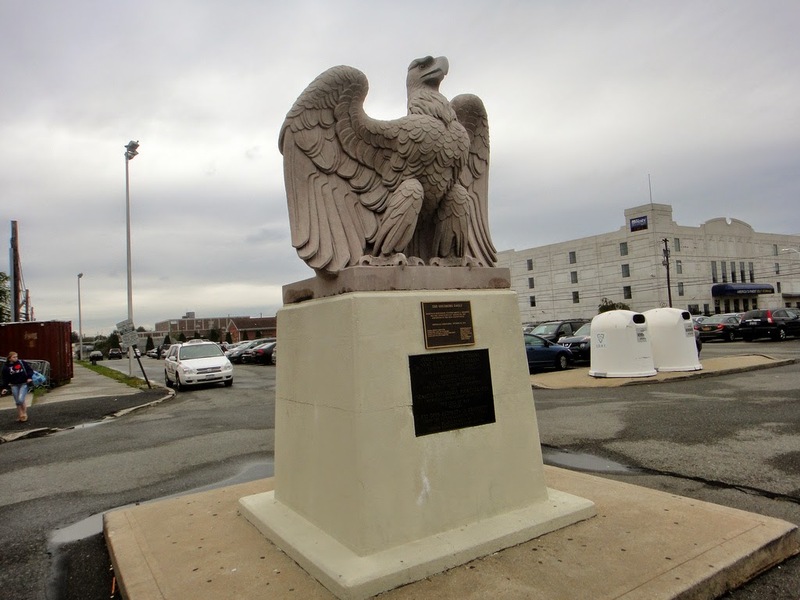 Hicksville High School teacher Samuel Goldberg claimed the eagle and brought her to Long Island. Since 1965, the eagle has been at the station. The years were tough on the bird. Her beak was broken. She was dirty. But in 2010, she received a restoration, funded by taxpayers and private donations. I'm thrilled that my tax dollars went to repair and restore this magnificent and important relic. Great architectural works with a rich history always capture my attention. I'm looking forward to seeing her every day on my way to work. I've often commented that Penn Station today is a rat hole. The eagle lets me participate, in my mind, in sophisticated train travel from a bygone era. And that's pretty cool. 18 of the 22 Penn Station eagles are displayed in various locations throughout the country. One is in the Smithsonian, and another is located at the current Penn Station. Take a look next time you're in the area. The USA is a young country, and these birds are over 100 years old. They're an important piece of our heritage. If you want to commute with me from Hicksville, let me know. I'll meet you by Big Bird. Just look for the guy staring upward, admiringly. I won't be tough to find.